If you go to www.whitehouse.gov in search of photos and information about Bo, the Portuguese water dog who became the First Pet back in April, you will have to do a search. Unlike the previous administration’s Scottish terrier, Barney who for a time had his own dedicated section of the White House homepage and even his own URL, Bo is a quieter presence. A little light probing yields his official portrait and the occasional candid of the dog frolicking with the first family, but, unlike Barney, whose role was to “humanize” the Bush White House, Bo’s isn’t the face this administration is most eager to put forward. As Dan Froomkin, who wrote the Washington Post’s White House Blog during the Bush years told me, “Well, it’s propaganda.” Yes it was. Obvious propaganda, clumsily executed, as weirdly off-kilter as Soviet social realism. The Bush website had a stars-and-stripes motif early on, and it gave way in the waning years of his administration to a simpler design based on a powder blue background. (At some point, Barney was banished to the White House Kids page.) The current graphics, while descended from the Bush website’s blue period, are infinitely more sophisticated. Boxes and shading are thoughtfully deployed and Bush’s slapdash sans-serif has given way to a careful menu of typographic approaches, with a serif font used for headlines and more formal text blocks and a sans-serif used for the ostensibly less formal blog copy. The overall look suggests that you are invited to a very prestigious function, like a royal wedding. The message you get immediately from the website is one of a White House that is superhumanly focused on its priorities: Afghanistan, health care, education and healthcare. A few weeks later, the four top stories are healthcare, jobs, accountability on Wall Street and jobs. If you have any doubt what the administration is hoping to accomplish at any given moment, you can just flip through those top-of-the-web-page stories. Just below the main story box is a smaller box that also leads to a presidential discussion of health care. Then there are two columns of text, at the left a stream of the latest stories from the White House blog and, on the right, a stream of “featured legislation.” This is the website of a very serious White House. What this means is that unlike the website of the Bush years, it’s not such good entertainment. Perhaps if you’re a Republican or a tea-bagger, this site is as hilarious for you as the Bush site was for me, but what I see when I look at it is an attempt at unrelenting diligence. “The Office of Public Engagement is the embodiment of the President’s goal of making government inclusive, transparent, accountable and responsible. Clearly these are not blogs in the loose-cannon, invective-spewing, Wonkette sense of the word. These are disciplined promotions, not of image, but of policy. It’s as if NPR were in the White House. The only spot where the policy-driven program loosens up a bit is in the Photo of the Day feature, which debuted in October. Many of them are the work of Souza, who was the White House photographer during the Reagan administration and came back after documenting Obama’s political career in a book called The Rise of Barack Obama. He is also director of the White House Photo Office, and it’s his photos that give the site its most compelling moments. Remember that shot of the president and Michelle Obama nuzzling in the service elevator between inaugural balls? That was his. "It tells a complete story," Souza said to the Washington Post. "You know exactly what's going on." The story that’s being told in the photos of the day is of a White House that’s doing its best to avoid demagoguery. It is as if the collective weight of these images is being used to undercut the Obama-is-the-world’s-biggest-celebrity meme. The president is not even in many of the photos, and when he is depicted, he’s not always the focal point. The caption on the December 1 photo says: “President Barack Obama reads as Marine One lifts off from the South Lawn of the White House,” but the photo is dominated by the helicopter itself and the Washington Monument. The president is a tiny figure framed by a square window like a character in an Advent calendar. On December 2: Three Marines in dress uniforms, two male and one female, look on as Michelle Obama “debuts the White House Christmas decorations” and “promotes the Marine Corps Toys for Tots” program. The interesting thing about this photo is that neither the first lady nor the Christmas decorations are visible in the picture. The two male Marines appear to be white, and stand at attention, their close-cropped heads, white belts and hands folded behind their backs. The only person looking at the camera is an African American female officer with a feminine bob and what looks to be a chest full of medals. Arguably, it is propaganda, but very carefully calibrated. On December 15, the photo du jour is of the presidential limo at a Home Depot in Alexandria, Virginia, where Obama has come to speak about energy-efficient retrofits. He is not in the photo. It is a picture that is less about the administration’s political agenda and more about the surreal nature of the presidency: the distinctive limo and the Secret Service agents look very strange parked in a big box store’s lumber aisle. The photos of the day read to me like an attempt, largely successful, to depict the culture of the administration as one that is pointedly egalitarian. Some of the images are inevitably not that different from Bush-era photos: the Obama family dispenses food to the needy on Thanksgiving, Obama strides across the White House lawn after his helicopter lands. We’ve seen those kinds of images before. But my favorite pictures on the site show the backstage life of the White House, a rehearsal for the state dinner with the Indian Prime Minister, for example, in which the president is nowhere to be seen. It’s a bit like watching a snippet from an episode of The West Wing. The overall message is that real people are living real lives and doing real jobs in this distinctively unreal place. And, of course, Bo shows up as the subject of the photo of the day from time to time. On December 3, Bo poses all by himself near a Christmas tree in the Diplomatic Reception Room of the White House. And on December 16, he’s shown after he’s hopped into the driver’s seat of a DC police car. The website demonstrates that the Obama White House is not immune to Bo’s allure, but unlike the previous administration, the cute doggy is not the single most appealing thing they have to offer. The Clinton web site also had a lot of too cute stuff about Socks the cat. I visited the office that built it for the NYT. It was regarded as an extension of the mail handling department, not the press secretary's office. Great article, as always, Karrie. Is the point of the article that propaganda is okay, as long as it's well done and appeals to you as the reader? I'm a little confused. Some excellent photography of Obama here. There is something about the man that really shows through in pics both moving and still, I real strong life force or something, hard to explain but its there. "unlike the previous administration, the cute doggy is not the single most appealing thing they have to offer." Whatever that is supposed to mean, it is ridiculous. Great article. I did enjoy it, but it's obvious you hate Bush and have used this platform not only as an astute observation to comment on the evolution of the WhiteHouse.org., but to jab a the previous administration. I hope everyone realizes that it is all propoganda. Obama's team is masterful at making it look natural and genuine. The web design is a separate issue from poltical leanings. I would expect the next administration to have an even better website simply for the reasons of advancements in web technology. It's obvious that Clinton's website seems poorly executed by today's standards, Bush's would be awkward (despite his personal awkwardness), and Obama's would Be more refined and current because that's just the way website are done now-a-days. In other words, the website has Obama's touch all over it - and it doesn't matter that he isn't a web-techie or anything like that; it's just that he's a serious man who gets the best/mature brains to work for him. There is little information about Bo in the whitehouse website. I have been searching for it and up until now i wasnt able to find one. I hope that they post some information and photos just like Barney. 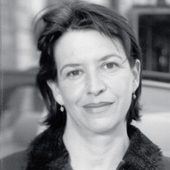 Karrie Jacobs is New York–based critic and journalist. She is a contributing editor at Metropolis magazine where she writes a regular column and a contributing editor at Travel + Leisure.